Self, Other, Mother Earth & Great Spirit. separately in “women’s” circles & “men’s” circles. 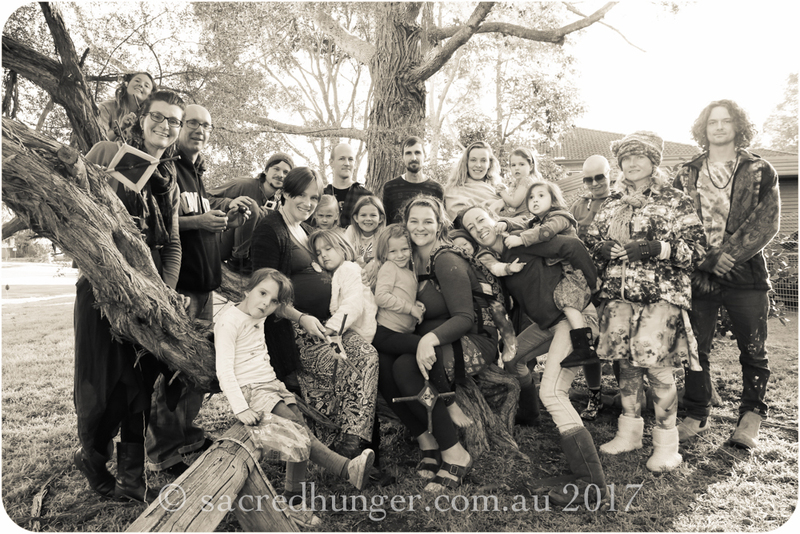 The Deepening Central Coast is in its third year of operation, and the final gathering of 2018 saw us catapulted into a new way of being in this beautifully held, sacred space. We found ourselves opening further…deepening…connecting in ways that we have not before. There was MAGIC and WONDER and genuine, deep enquiry. We experienced vulnerability…authenticity…POLARITY! It really was amazing. 13 brave open-hearted souls showing up, for themselves and all their relations! 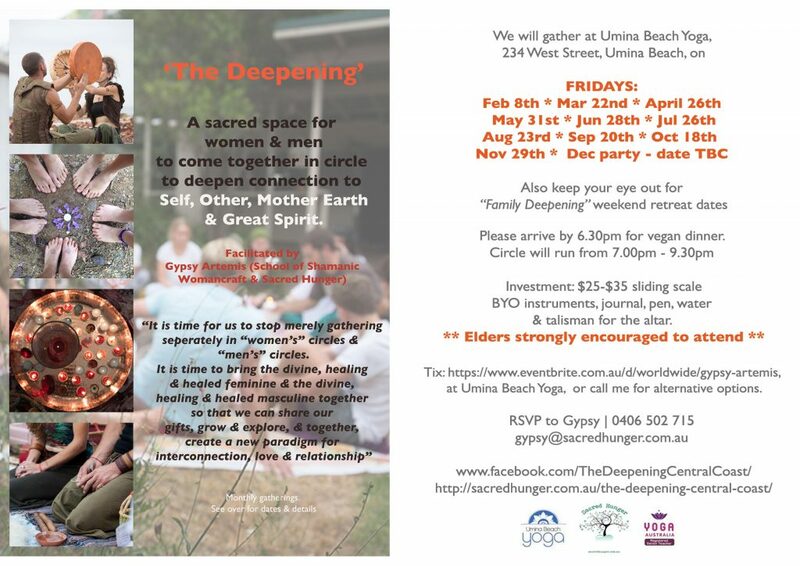 2019 sees us in a great new venue at Umina Beach Yoga (thanks Carloyn and Helen for the warm welcome and for “getting my work in the world!) and we are so excited to be back on track with regular monthly circles now that my son (aged 2) is more manageable and with his dadda regularly. 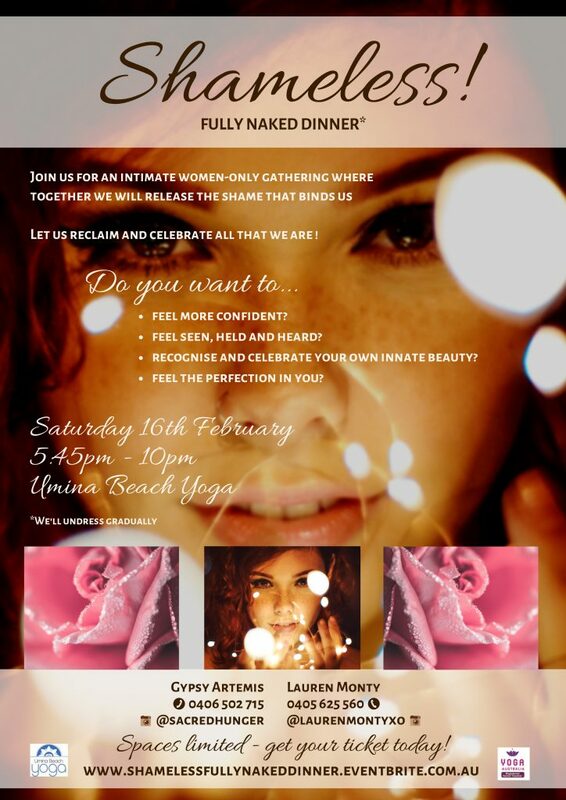 We gather this week Friday 8th February…6.30-9.30pm. See you there! 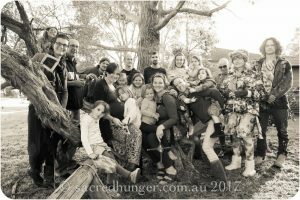 The last time we met and had a Family Deepening, it was soooo amazing….so many kids and mammas and pappas and well, “tribe”. How blessed we are as a community to be able to gather in this way. Anyway, now that my son is getting bigger, work is getting easier, and I am better able to answer my Soul’s calling to this work. WOW! It’s been months since I last posted on here..and so much has happened! And is STILL happening. 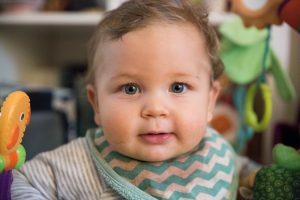 I am pleased to say that I gave birth to a gorgeous, healthy baby boy at the end of August. He’s now nearly 2 months old and an absolute delight! I am also still doing other work, such as assisting with some beautiful retreats in the mountains…continuing with my henna tattooing…and about to schedule some shamanic medicine drum making workshops for 2017. So we seem to have struck a balance between parenting and working with our community! Blessings…and we hope to see you soon! Hello from the depths of the “almost” dark moon and Samhain! After a lil bit of time away from website updating and instead, baby-growing (I am pregnant! ), I am pleased to be writing with news of our final medicine drum making offering for 2016. We will gather for the weekend of 11-12th June, on the beautiful Central Coast, and together, birth ourselves and our amazing winter drums into being. This process is so incredible! I can’t even begin to explain. The drum itself is just a by-product of the delving into our hearts, minds and souls. It’s life changing! 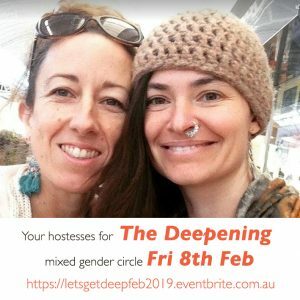 The workshop is open to women and men and we encourage you to stay over with us the night (Saturday) and fully emerge yourself into the process. Winter is a great time to birth a medicine drum because it will just get tighter over the summer months. Having said that, sometimes it doesn’t really matter much what season you make it in, or where, as the drum I made on country over the winter in the hot dry Kimberely (NT) works perfectly in the damp conditions of chilly Victoria! 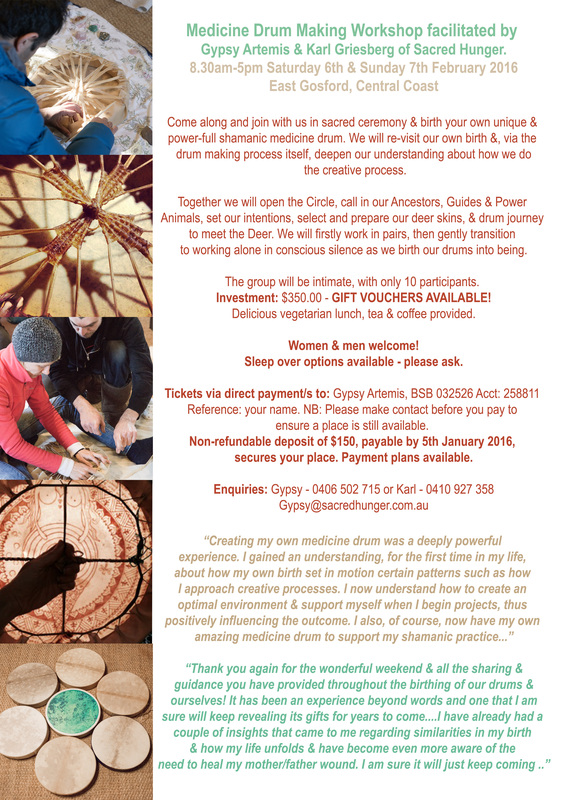 We have 2 places left on our up-coming Shamanic Medicine Drum Making Workshop on the Central Coast on February 6-7, 2016. Here’s the link to the Fb event listing. Enquiries and late registrations welcome as we have ordered supplies for a FULL WORKSHOP! In the absence of anger…..
I’ve had quite a journey this past 12 months. And so many other people are too. Astrologically, we are being asked (forced!?) to let go of all that no longer serves us, to make way for the NEW!! That can be scary but also very exciting if you are prepared to surrender to what IS! And if you would like to read a little about what I have been up to, check this article out. It’s my most recent piece on conscious uncoupling and letting go! Here are a few ore photos to accompany the piece too. Ahhh……it’s a few months off yet, but as deposits hit our account and people step up for our February medicine drum making workshop, the excitement is building this end! I’m feeling that this workshop is going to be full! Yay! 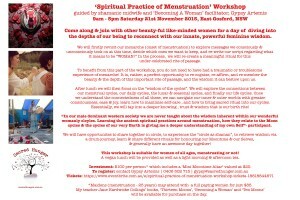 The workshop is open to women and men, and will be facilitated by myself and Karl Griesberg (SOTEMS). 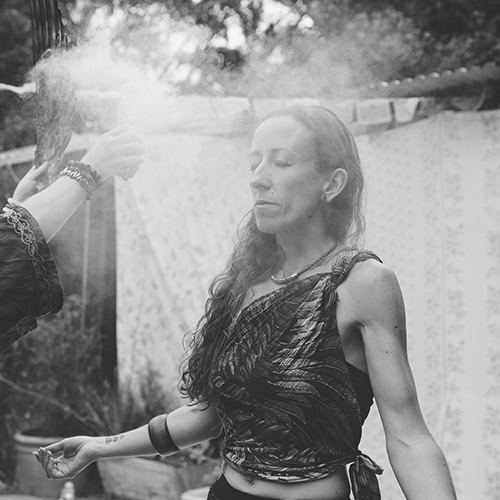 It’s such an amazing weekend, learning about ourselves, birthing our own shamanic medicine drums, connecting on the physical and spirit realms. It is suitable for adults and teenagers. This workshop will be at Circle of Life at East Gosford. For further details please see the flyer below. 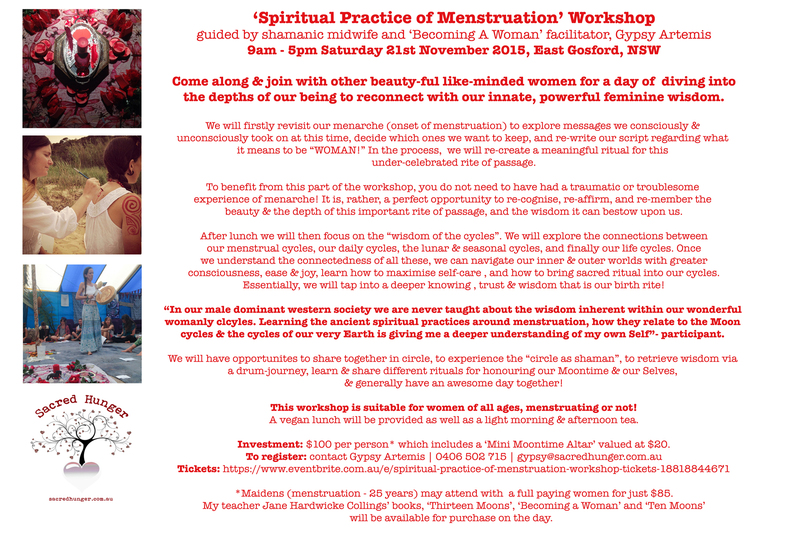 I am so so SO pleased to announce that I have finally set a date for my Central Coast based “Spiritual Practice of Menstruation” workshop. 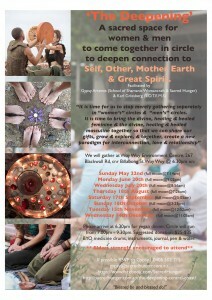 I can’t wait to share all this awesome information with you….sit in sacred space together….create ritual and ceremony…and see you all blossom!! We have decided to postpone our SPRING workshop, and instead run it in the SUMMER. It all felt a little rushed getting home from travelling and having had no time to advertise. We have taken some time to breathe!! Here’s the updated flyer. Please feel free to make contact via the email provided on the flyer if you have any questions etc. Due to the timing, GIFT VOUCHERS will be available and would make fab Xmas presents!